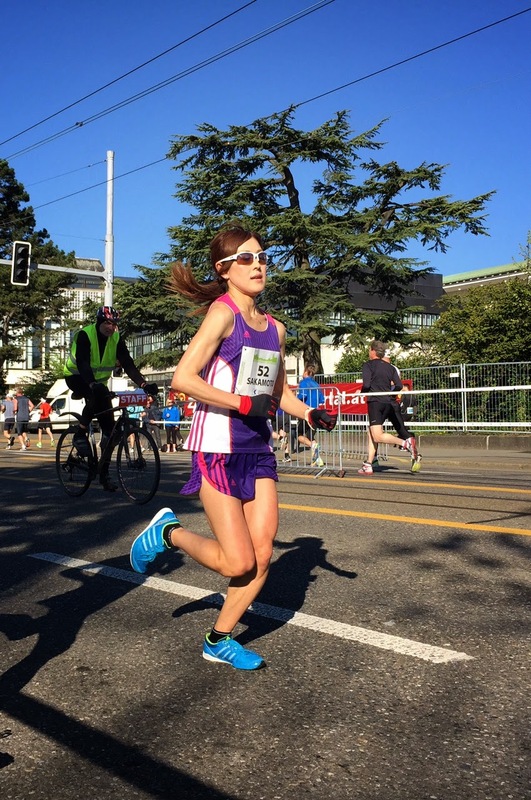 Making her international marathon debut in excellent conditions on an almost perfectly flat course, Yoshiko Sakamoto (Y.W.C.) won the Zurich Marathon with an evenly-paced solo run that put her more than 8 minutes ahead of runner-up Nicola Spirig (Switzerland), the London Olympics triathlon gold medalist. A 36-year-old mother of three, Sakamoto was a high school star who quit running completely for 9 years before starting again in her early 30s and set a PB 2:36:29 in January this year. 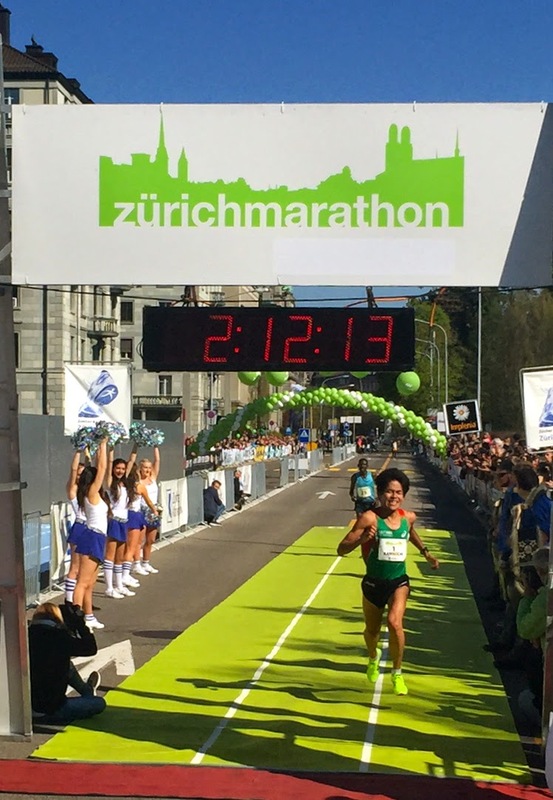 Running in Zurich with support from JRN and targeting a 2:34 PB, Sakamoto was slightly off pace from the beginning but never flagged dramatically, going through halfway in 1:18:18 and facing headwinds on the return trip into town before crossing the finish line first in 2:37:47. Australia's Jane Fardell, a late addition to the field, ran 2nd throughout the race but with a little over a km to go was run down by Spirig, the fastest in the field over the final quarter of the race. "I'm so relieved and happy to have run a good time," Sakamoto said post-race. "I had had some leg pain a couple of weeks ago that cut into my training, but it was no trouble during the race. Partway through I thought I was going to fade and not break 2:40, but I started overtaking some men and that kept me going. I can't believe I really did it. I want to take it easy for a little while now and then race on the track. My next marathon won't be until the fall." The men's race was likewise slightly behind pace from the start, a ten-man group led by pacer Boaz Kipyego (Kenya), Edwin Kemboi Kiyeng (Kenya) and Yuki Kawauchi (Saitama Pref. Gov't) staying right together on a pace hovering around 2:11 through 35 km before Kiyeng threw in a surge that put him in position for the win in 2:11:35. Kawauchi fell to 7th in the wake of Kiyeng's move, but clawing his way back up he was in 4th by 41 km and outkicked Ethiopian Gebre Mekuant Ayenew by 4 seconds in the final 250 m to take 2nd in 2:12:13, his best time so far in a year in which he has struggled to recover from a bad ankle sprain in late December. Post-race Kawauchi commented, "I'm disappointed not to win, but this was my first time making the podium in Europe so I'm very happy. My time was not what I was going for either, but there was absolutely no pain or trouble with my ankle and it was just a case of my fitness not being up to where I thought it was yet. In terms of level the Zurich Marathon was the perfect race for where I am right now and I'm extremely glad I chose it for my main spring race."